Hello world! The weekend came and went as fast as I can say Happy Holidays. The holidays are now in full swing. We had an annual holiday party with our friends on Saturday which was a blast. I gave the camera a rest for the night however so you’ll just have to take my word that it was a great party full of lots of laughs, great food, and great friends. The last time we caught up was on Friday, so it’s time to play catch up from Friday night, Saturday and Sunday. So here we go! On Friday we went over to my mom and dad’s (and Kev too) to watch our wedding video with them. We laughed, some of us teared up, and really enjoyed reliving the memories of our wedding day together. 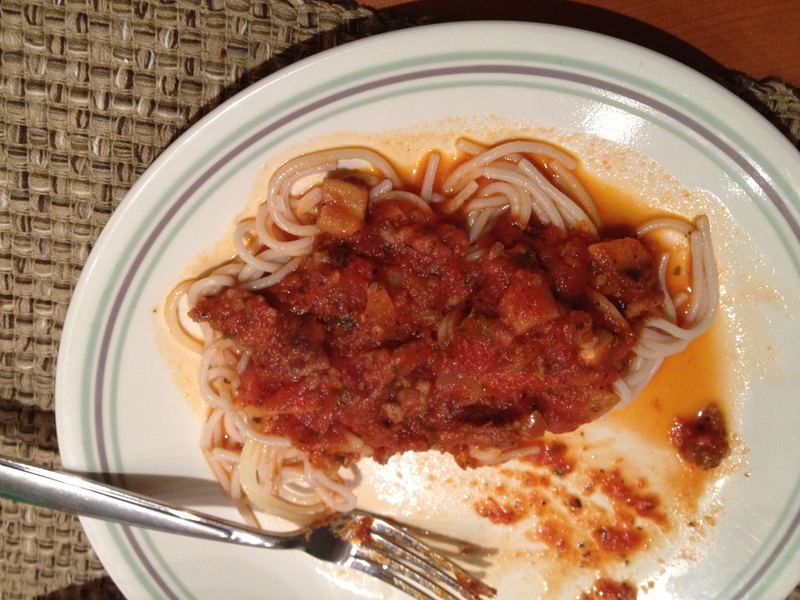 Mom made us gluten-free spaghetti noodles with red sauce that had italian sausage, mushrooms, onions and spinach. It tasted SO good and I could not tell the difference in taste or texture between gluten-free and ordinary pasta. We also had a side salad—can’t forget about the greens! I had my standard pre-run breakfast of banana and peanut butter before Dana, Moose, and I hit the road for a 3.5 mile run. Sat: week 1—3.5 mile run; week 2—4.5 mile; week 3—5.5 mile; week 4—6.6 mile; rest or short run; then the 10K! The weather has been pretty unpredictable around here. On Saturday morning the temperature was around mid to upper 30’s and now this morning the thermometer says it’s 49º F outside! It’s supposed to drop down again later in the week but I am loving the warm for as long as I can get it. After our run we made a stop at Caribou Coffee for their BOGO 20¢ deal. We treated ourselves to the Light Salted Caramel Dark Chocolate Mocha. That was the same one I got in Atlanta and once again, it was like taking a bite of dessert each time I took a sip. Amazing. We continued our journey over to Minneapolis to pick-up our bibs and race gear for the 10K for early packet pickup. 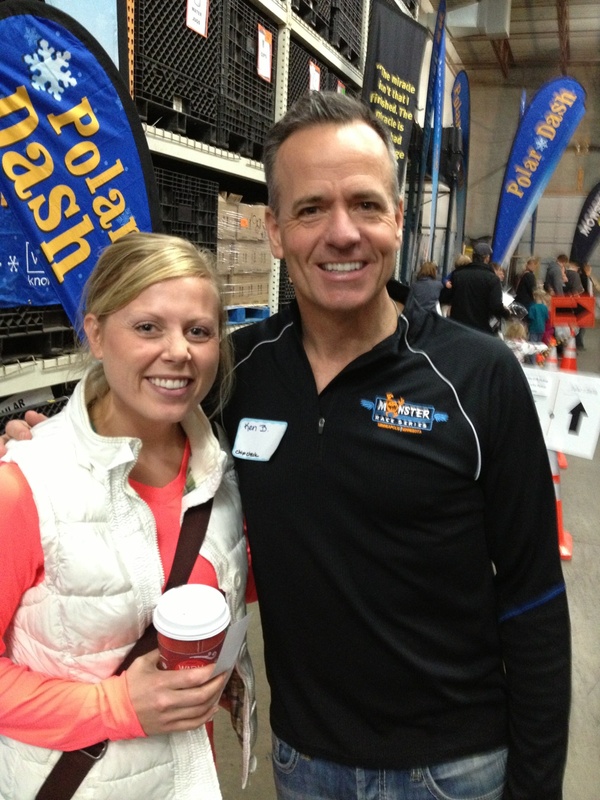 We even got to meet a local meteorologist, Ken Barlow, who was volunteering at the pick up! As you can see in the photo I was a tad bit excited about it. 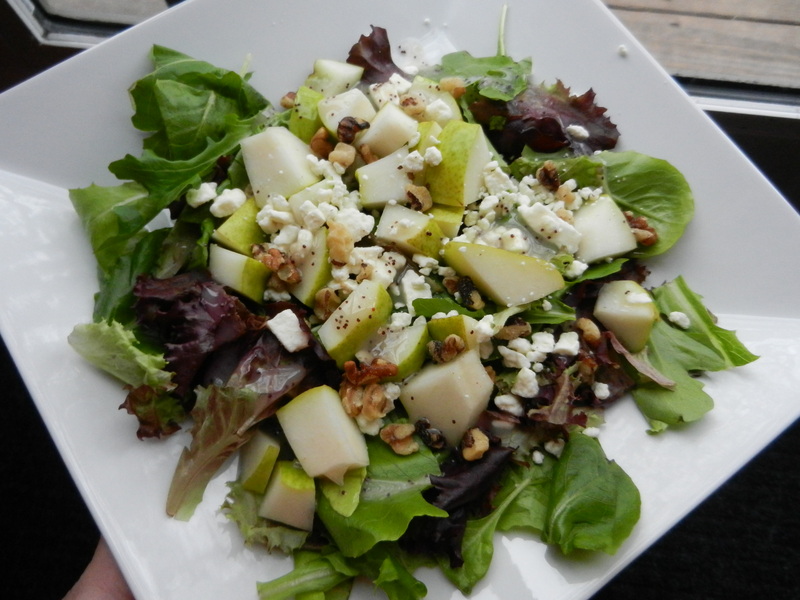 Once we arrived home I made myself a simple fall salad with mixed greens, pear, feta cheese, walnuts, and poppy-seed dressing. 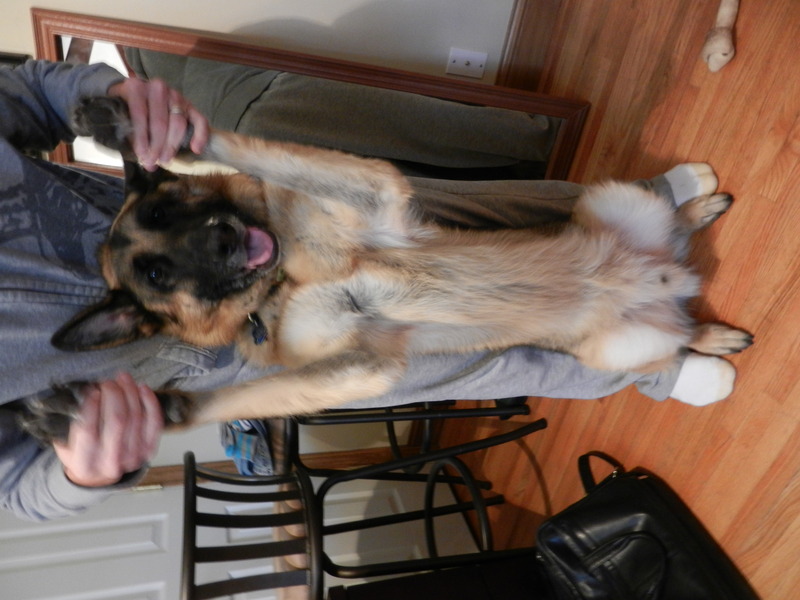 After some food prep, and errands, we said good-bye to the pooch and headed out to the holiday party for the evening. 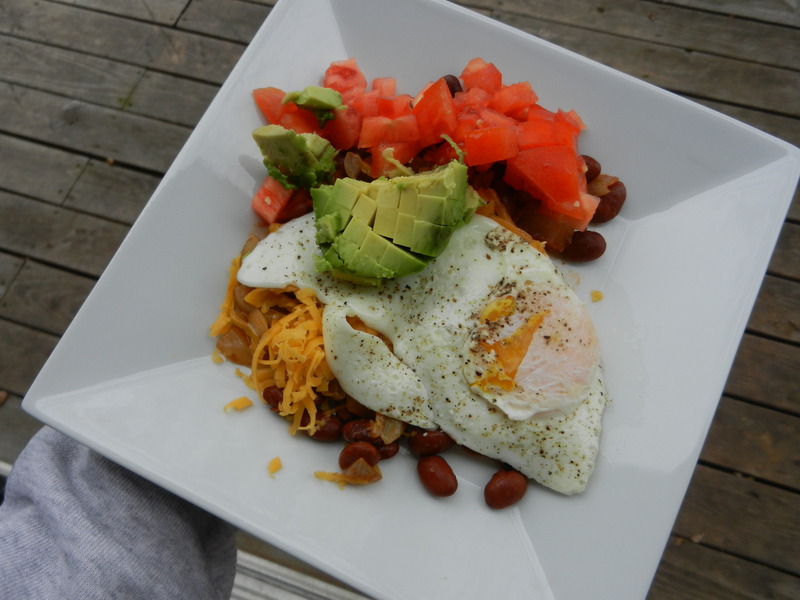 Brunch: sautéed onion with chili beans topped with cheese, a runny egg, tomatoes, and avocado. Outstanding. Next on the agenda was flipping through the Sunday paper, coupon cutting, vegging on the couch, and watching the Vikings lose. 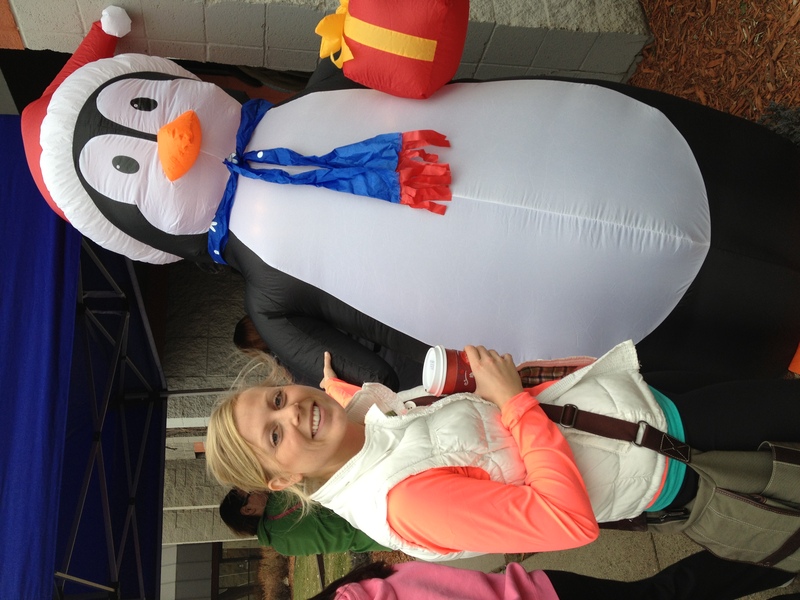 Courtney of Sweet Tooth Sweet Life is hosting a 2012 Closeout Workout Challenge. The challenge is to complete 2012 reps of exercises of your choice by the end of 2012. After day 2 I have 1,837 reps to go. I figure it’s worth a shot, even if I don’t reach 2012, I was still doing extra activities daily that I wouldn’t normally do. It’s a great motivator for me to do more strength activities. 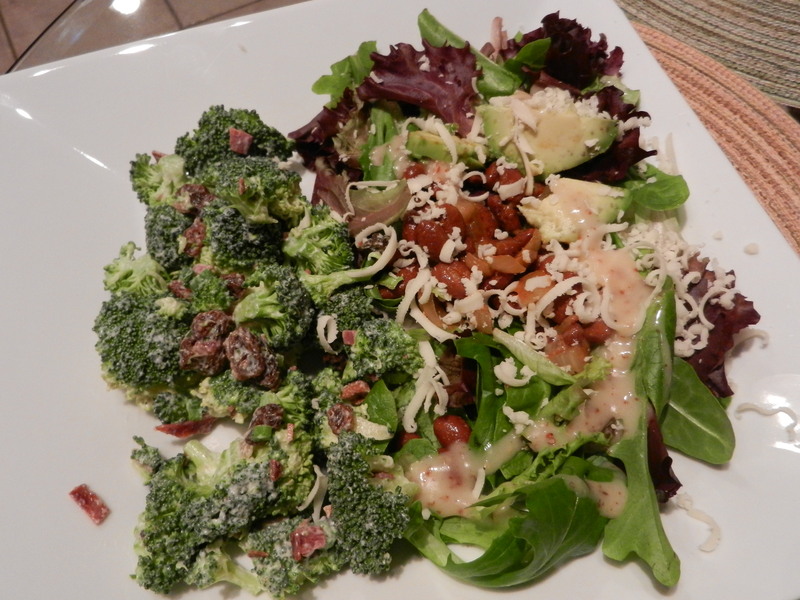 Dinner: Broccoli salad (recipe to come most likely) and mixed greens with leftover beans from the morning, avocado, and honey mustard dressing. If you can’t tell I was trying to veggie load yesterday. I didn’t get much sleep on Saturday night so I was trying to energize my body with good foods versus falling into the ever-so-easy slump of eating not so good food choices when feeling tired. Sleep, activity, and food choices are all very related. It’s important to keep all three aspects in check in order to stay healthy. I’m going to end the post here because it has gotten random enough and I was able to condense this weekend to a manageable length post. I hope you are all having a fine Monday. Catch up with you soon! This entry was posted in Breakfast, Dinners, Friends, Lunch, Moose, Workouts and tagged 10K training, 2012 Closeout Workout, broccoli salad, Brunch, Caribou Coffee, Gluten-Free Spaghetti, Ken Barlow, run, Salad, treadmill walk by Melanie. Bookmark the permalink. Your brunch on Sunday looks delish. Love the egg on top. Also, your comment about eating veggies when you’re tired…it’s SO hard to make healthy choices when you’re exhausted like that but I totally agree that it is the best way to keep yourself awake and feeling good regardless of lack of sleep! Veggies rule. It really is so difficult but you know it’s the best way to feel better!